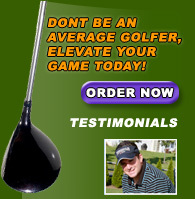 "As a senior golfer, I need a boost in flexibility and focus. 5 Minutes to Tee-Time gives me that boost starting at the first tee!" "There is no greater feeling than beginning your golf round swinging the club like you've already played 9 holes, I credit the physical (and mental) edge I have to 5 Minutes to Tee-Time." "I find that while I developed a pre-shot routine, I never developed the equally important pre-round routine. By moving through these simple stretches, it gets my body prepared, and it also gives me the time to get my mental game focused on the round ahead." "I suffer from lower back pain and sometimes golf can be a real strain, 5 Minutes to Tee-Time loosens me up and gets me through the round pain free." "I am the type of golfer who used to show up for a round of golf, do a few quick stretches, and think I was ready for my round. I never realized how wrong I was until I started using 5 Minutes to Tee-Time. Now, when I get on the first tee, I feel like I am really ready to play. I never felt that loose until I was well into my round and now it happens before the first tee. This is a great product and I have recommended it to all my golf friends." If you wish to add to add a testimonial, please contact us.